The Pointe provides the ultimate in coastal accommodations with every luxury feature you could wish for. 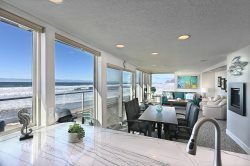 This wonderful end unit is dramatically located on the first floor with a front row seat for watching the dramatic crashing waves, majestic winter storms, and the pod of resident gray whales, right out your back door. Beautiful coastal décor and a PRIVATE HOT TUB on the DECK, make this spot is perfect for a honeymoon, anniversary or a romantic weekend to escape the stresses of everyday life. New carpet, News stainless steel appliances, New tile floors, New kitchen counters and glass tile backsplash, New slab granite bath counters. Complete remodel of master bathroom – designer spa style larger tile shower with glass tile accents and body jets. New linens, bedding, and beautiful glass and coastal décor throughout the unit. New TV’s in living room and bedroom. Enjoy the breathtaking view and sounds of the crashing surf from the private covered patio and spacious Living Room - which also has a river rock gas fireplace. The large Master Suite has a king-size bed and cozy bathrobes for your trip to the deck to sit in the hot tub...complete relaxation. Our favorite vacation spot, beautiful view and the kitchen has everything you need. Beautiful, clean and consistent. (I've stayed there about 10 times) Can't wait to come back! Love the HOT Tub and the gorgeous view! Very easy to book. And a stunning condo even without a view I would stay there again. Just a view that was amazing. Loved the view. All the glass work on the walls added to the five star feel, artful decorations and appliances were top grade. The hot tub and the location were amazing! Being on the bottom floor during a storm was an incredible experience. My husband and I stayed up late watching the huge waves crash into the rocks. accommodations were great and view was fantastic! We have stayed in 2 other Blue Pacific rentals in Lincoln city and they were very nice also. But this is our new favorite place!! This place was beautiful!!! This condo was beyond gorgeous!!! So comfy and warming!!! The whole process was easy, directions and expectations of renter were well outlined. Excellent communication for reservations, very informative, easy to deal with. Upon opening the front door to the condo and looking straight ahead and seeing the ocean we knew our stay would be wonderful. The layout of the condo and the decor were absolutely beautiful. Would I stay here again and would I handle my reservations through blue pacific vacation rentals again; yes yes yes. We are looking forward to our next ocean stay, soooo relaxing. We have rented this condo 4 or 5 times.....it is our favorite! Love the hot tub and whale sightings are a sure thing! Always clean and love all the windows! Very nicely appointed and decorated condo. We love the hot tub on the patio! I was impressed that Blue Pacific was prompt in giving me information two weeks before my stay on information about the condo like the code to get in. Loved it! Great location. We saw many whales. We were given a bottle of wine, 2 bathrobes to wear, a comfortable, warm bed, glass cookware. The condo was very comfortable. We enjoyed our first time condo vacation it was very relaxing...loved the whale sights! Amazing condo amazing views! The entire process was smooth and the rental property was exactly as pictured. Helpful and courteous. The property was better than expected. Everything was clean and well cared for. Booking and visiting were so easy. Well decorated, quality furniture, bedding, bath and kitchen. Dream hottub. Spectacular, well cared for property on the ocean. It was very easy to make the reservation and the staff was friendly and helpful. The property was great, we will definitely stay here again. Great ocean views. Kitchen was great, had everything and more that we needed. 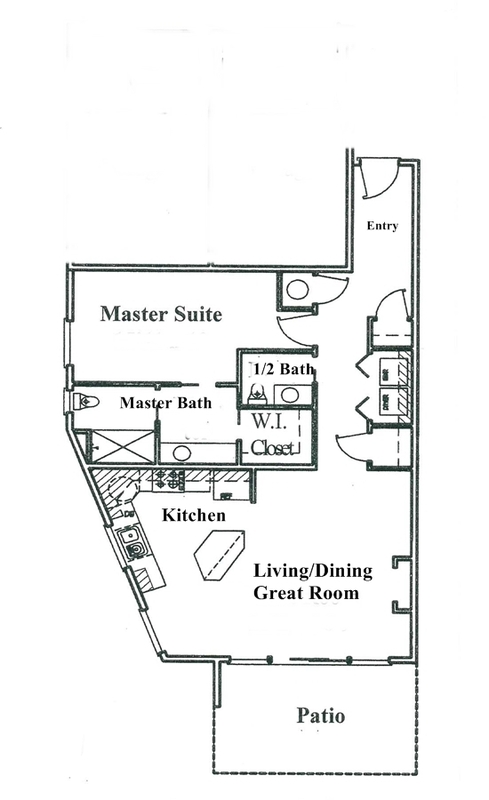 Loved the floor plan. Very clean. Loved the kitchen, appliances seemed to be high-end and all the utensils and dishes and cookware were great, it had everything needed to cook most any type of meal.